Beautifully engraved certificate from the Edify Corporation issued in 1997. This historic document was printed by the Security-Columbian Banknote Company and has an ornate border around it. This item has the printed signatures of the Company's President and Chief Executive Officer, and Secretary. Established in 1990, Edify helped define the era of customer service. Headquartered in Santa Clara, California, the company has 175 employees worldwide, with international sales and support offices in London, Rome, Tokyo, Hong Kong, and Sydney. Today more than 350 financial institutions have web sites that rely on Edify technology. According to the Gartner Group, Edify is the market share leader in high-end voice self-service systems. In 2000, Edify enabled wireless customer service over all three network standards: WAP, iMode, and SMS. In 2001, Edify launched the first fully automated Email Response Technology using Deep Linguistic Processing. For 2002, Edify offers the Triple A Solution to automate services, assist service representatives, and analyze data. Edify develops customer interaction solutions for all customer contact channels. Enterprises worldwide use Edify's proven, open platform to integrate and manage their customers' natural choice of web, voice, wireless and e-mail communications, strengthening customer relationships and enterprise profitability. The company's software has been licensed to more than 1,100 organizations worldwide. Edify software is distributed directly and through leading solutions providers, applications partners and distributors around the globe. 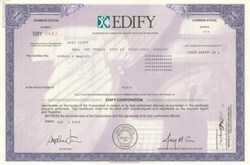 Edify Corporation is headquartered in Santa Clara, Calif. with international offices in London, England, Sydney, Australia, Tokyo, and Hong Kong. Edify is a subsidiary of S1 Corporation, the pioneer of Internet banking and today's leading provider of innovative Internet-based financial services solutions.